So basically this person was a very close friend of mine that turned into … an acquaintance. The end of a friendship is not a break up like in a relationship. You don’t go to your friend and say “look it’s finished between us, goodbye” (to make it short), it doesn’t really make sense in friendship. In friendship if something changes, the friendship still remains but it just fades, it’s a slow end. So it was a slow end. The end started one year ago and was effective in February when I mentally decided and accepted that we were not friends anymore. It’s just little events that prove the friendship is fading and I also sensed that I was fundamentally changing until the point where I couldn’t interact anymore with that person. After explaining what was wrong, she didn’t really seem to care or realize so I stopped being in touch with her online and offline. After months of not talking to her, I had been away several months and in September I got back in Paris where she lives but I had no news from her and I didn’t know where she was until… I ran into her in the supermarket. Typical movie scene. “Hi!” she said as if everything was fine, “Hi…” I said, thinking “Yes…?”. We exchanged news as people meeting randomly and honestly it’s fine to just say hi, but it’s tiring, it’s just a wild comedy. She basically told me that she lived two blocks away from me, in the same area. I just said “Wow” and finished the scene wishing her good luck with her groceries and take care. That was it, the first time. Today was the second time I met her. Again. Ok, I know she lives around, it’s purely statistical to meet her again, but come on!! Who is the designer of my life?! Such a bad designer. Eeeevil! 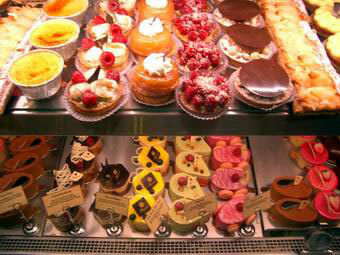 So I was in front of this French bakery hesitating to either or not have a cake as I usually like to have after work. But since I was on my way to meet a friend for dinner later, I didn’t know if it was reasonable. I was on the sidewalk staring at the bakery unable to decide but progressively tempted. Then, I remembered I needed to call the friend I was meeting up with later, so to speed up my moment of hesitation, I called my friend. While I was talking to her, I was positioning myself to have a better view at the window. I was observing what cakes were in the bakery. I love doing that. French cakes are so pretty. I was scanning the cakes one by one, color by color, browsing the whole store itself until… I bugged. My visual recognition system stopped at her face, she…she was in the store!! Oh no. Her again. I stayed outside. My appetite for a cake dramatically disappeared. She came out of the store with her boyfriend, but yay I was on the phone ! I just continued talking on my phone and we went opposite ways. Thank God I was on the phone !! I know, who thinks like me? Am I really terrible? I just thank technology for this. I didn’t have to play the wild comedy of “Hi, how are you?” or the sad drama of passing by and ignoring her or the awkward 1 second moment of looking at her maybe or maybe not and smiling maybe or maybe not. I think that if I was not on the phone at this moment, I would have noticed her and just smile and go my way anyway. There was nothing more to say. My point is, my phone just helped me avoid an awkward moment of existence and for that I love it ! And when you think about it, many of us use technology to avoid those awkward moments of existence. Before a meeting, when you’re waiting for the meeting to get started, you don’t really have much to say to the other people waiting, or you don’t want to just wait, so you pull out your phone and do something with it. In a party where you don’t know many people, at one point for sure you pull out your phone and do something with it too. No? What do you think? Have you ever been saved by technology from an awkward moment of existence ? What do you do in those awkward moments?